Why don’t our teams have the tools they need? Pharmaceutical corporations neglect them as there is no money to be made. "We’re sorry that we don’t have a medicine proven safe and effective to kill the Ebola virus. We’re sorry that we don’t have a vaccine. We’re sorry that we’ve failed to stop the epidemic. We're fighting a forest fire with spray bottles." Pharmaceutical corporations’ top priority is making shareholders happy. So, if a medicine, test or vaccine won’t earn big money or boost stock prices, it might not get made. No matter how badly it’s needed. That’s why when Ella Watson-Stryker and her MSF colleagues faced the deadly 2014-2016 Ebola outbreak in West Africa, they were empty handed. They did not have the tools to treat people with this devastating disease, and the outbreak claimed more than 11,300 lives in six affected countries. In fact, scientists had developed a promising experimental Ebola vaccine in 2002. But making better tools to use against Ebola wasn’t profitable enough for the pharmaceutical corporations to finalise the vaccine's development. So it didn’t happen. During an Ebola outbreak in the Democratic Republic of Congo declared in May 2018, MSF administered this trial Ebola vaccine to frontline healthcare workers and contacts of confirmed Ebola cases as part of the overall strategy to control the outbreak in collaboration with the Ministry of Health and WHO. 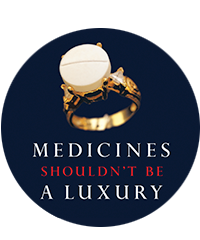 Our Lives on the Edge report looks at how pharmaceutical corporation practices keep crucial medical tools out of the hands of our teams. New and affordable drugs, vaccines and diagnostics are needed urgently. Find out why these life-saving products aren’t yet in reach.